Self-efficacy is significant for attaining outcome or goals especially in the implementation of a learned skill [1Saeed R, Mussawar S, Lodhi RN, Iqbal A, Nayab HH, Yaseen S. Factors affecting the performance of employees at work place in the banking sector of Pakistan. Middle East J Sci Res 2013; 17(9): 1200-8. [http://dx.doi.org/10.5829/idosi.mejsr.2013.17.09.12256] ]. Self-regulatory abilities are central importance for attaining personal goals of the individual [2Newark PE. Self-beliefs, resources, and self-regulation in adult ADHD psychotherapeutical relevance and implications (Doctoral dissertation, University_of_Basel) 2014., 3Warne T, Johansson UB, Papastavrou E, et al. An exploration of the clinical learning experience of nursing students in nine European countries. Nurse Educ Today 2010; 30(8): 809-15. [http://dx.doi.org/10.1016/j.nedt.2010.03.003] [PMID: 20409620] ]. Self-efficacy plays a major role in the behaviour of a human being by how he/she approaches a goal, task or a challenge so that the desired level of performance is attained [4Cherian J, Jacob J. Impact of self-efficacy on motivation and performance of employees. Int J Bus Manage 2013; 8(14): 80. [http://dx.doi.org/10.5539/ijbm.v8n14p80] -6Takase M. The relationship between the levels of nurses’ competence and the length of their clinical experience: a tentative model for nursing competence development. J Clin Nurs 2013; 22(9-10): 1400-10. [http://dx.doi.org/10.1111/j.1365-2702.2012.04239.x] [PMID: 2295 7733] ]. Self-efficacy is also crucial to obtain quality care of client especially those suffering from HIV/IADS. The basic principle behind Self-Efficacy Theory is that individuals are more likely to engage in activities for which they have high self-efficacy and are competent on those activities; and less likely to engage in activities they are not competent [7Bandura A. On the functional properties of perceived self-efficacy revisited 2012. [http://dx.doi.org/10.1177/0149206311410606] ]. Therefore, self-efficacy can be improved by accomplishing small tasks and gaining confidence in one’s ability and support from the experienced person or colleague [8Kennedy E. The nursing competence self-efficacy scale (NCSES): An instrument development and psychometric assessment study 2013.-12Van Damme W, Kober W, Laga K, Letsoalo M. HIV Nursing Matters. HIV Paediatrics Issues 2011; 2(3): 12.]. Individual’s sense of self-efficacy has an impact on performing a skill which can result in good or poor quality of care for clients [13Mensah AO, Lebbaeus A. The influence of employees’ self-efficacy on their quality of work life: The case of Cape Coast, Ghana. Int J Bus Soc Sci 2013; 4(2)-16Azia IN, Mukumbang FC, van Wyk B. Barriers to adherence to antiretroviral treatment in a regional hospital in Vredenburg, Western Cape, South Africa. South Afr J HIV Med 2016; 17(1): 476. [http://dx.doi.org/10.4102/sajhivmed.v17i1.476] [PMID: 29568618] ]. Therefore, sound decision making in clinical performance is affected by one’s self-efficacy, support and motivation. There is limited literature in South Africa regarding self-efficacy in implementing Nurse initiated and management of Antiretroviral Therapy (NIMART) programme with a quality outcome. Therefore, this narrative review was conducted to analyse literature on self-efficacy and clinical performance for quality of care among nurses regarding the implementation of NIMART programme. South African Department of Health identified a need to implement strategies to upskill nurses in the clinical management of HIV and AIDS, for effective and efficient management of people living with HIV/AIDS [17Mngqibisa R, Muzigaba M, Ncama BP, Pillay S, Nadesan-Reddy N. Upskilling nursing students and nurse practitioners to initiate and manage patients on ART: An outcome evaluation of the UKZN NIMART course. Afr J Health Prof Educ 2017; 9(3): 153-8. [http://dx.doi.org/10.7196/AJHPE.2017.v9i3.879] ]. One of the strategies identified was the nurse-initiated management of antiretroviral therapy (NIMART) course. NIMART practise covers the following activities: (i) clinical aspects of HIV infection and AIDS i.e. staging; (ii) HIV management in adults and children, which includes opportunistic infections and their presentation and management; (iii) Initiation ART in adults and children, which includes classes of drugs and their modes of action; (iv) reading and implementation latest SA guidelines; (v) management of drug-related toxicities and including treatment failure; (vi) HIV in women; (vii) HIV and Tuberculosis (TB) comorbidity; (viii) ethics related to HIV and AIDS; and (ix) palliative care for People Living with Human Immune Virus (PLHIV). A search was conducted using electronic database EBSCO, Google Scholar, Medline, PubMed, Psych info, BIOMED Central articles and journals published between 2007 and 2017 were selected for analysis. Studies were limited to self-efficacy and clinical performance, written in English language and published between 2007 and 2017. The retrieved articles were scanned for relevancy by reading their abstracts. The articles were relevant if these two key search words, ‘self-efficacy’ and ‘clinical performance’ were appearing in the article. Articles were also included if they have information on a relationship about self-efficacy and clinical performance. Only English written articles were reviewed and analysed. Table 1 shows the inclusion and exclusion criteria of articles for analysis. The findings pertaining to self-efficacy, clinical performance and quality of care identified in various articles are presented in Table 2. The literature searched on self-efficacy and clinical performance produced 278 published papers (Fig. 1 ). 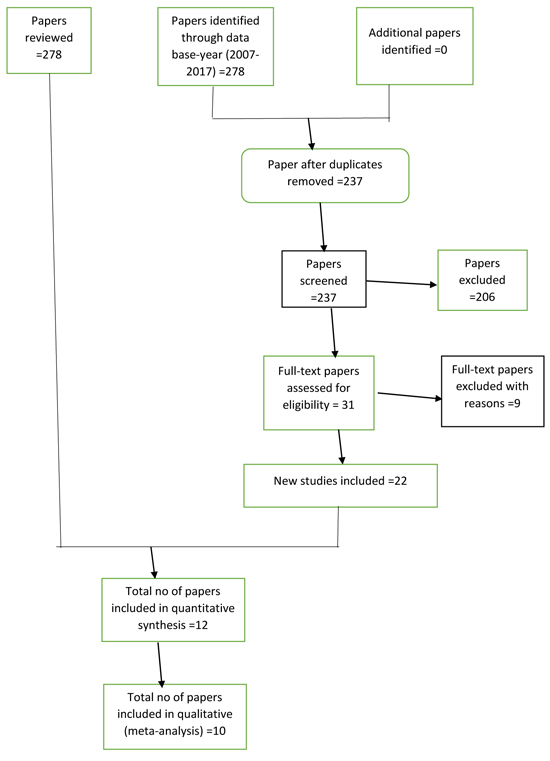 Forty-one duplicate papers were removed and 211 papers do not have information on self-efficacy, clinical performance, and quality of care, HIV/AIDS, antiretroviral therapy and literature review. Ultimately, 22 published papers were identified which meet the criteria for inclusion. The findings of the published papers were highlighted in a narrative text (self-efficacy, clinical performance and quality of care) (Table 1). From included reviewed papers, 12 of the papers used quantitative approach [3Warne T, Johansson UB, Papastavrou E, et al. An exploration of the clinical learning experience of nursing students in nine European countries. Nurse Educ Today 2010; 30(8): 809-15. [http://dx.doi.org/10.1016/j.nedt.2010.03.003] [PMID: 20409620] , 6Takase M. The relationship between the levels of nurses’ competence and the length of their clinical experience: a tentative model for nursing competence development. J Clin Nurs 2013; 22(9-10): 1400-10. [http://dx.doi.org/10.1111/j.1365-2702.2012.04239.x] [PMID: 2295 7733] , 8Kennedy E. The nursing competence self-efficacy scale (NCSES): An instrument development and psychometric assessment study 2013., 17Mngqibisa R, Muzigaba M, Ncama BP, Pillay S, Nadesan-Reddy N. Upskilling nursing students and nurse practitioners to initiate and manage patients on ART: An outcome evaluation of the UKZN NIMART course. Afr J Health Prof Educ 2017; 9(3): 153-8. [http://dx.doi.org/10.7196/AJHPE.2017.v9i3.879] , 25Cameron D, Gerber A, Mbatha M, Mutyabule J, Swart H. Nurse-initiation and maintenance of patients on antiretroviral therapy: are nurses in primary care clinics initiating ART after attending NIMART training? S Afr Med J 2012; 102(2): 98-100. [http://dx.doi.org/10.7196/SAMJ.5195] [PMID: 22310442] ] and 10 papers used qualitative approach [26Shirazi F, Sharif F, Molazem Z, Alborzi M. Dynamics of self-directed learning in M. Sc. nursing students: A qualitative research. Journal of advances in medical education & professionalism 2017; 5(1): 33.-36Mpondo F, Ruiter RA, van den Borne B, Reddy PS. Self-determination and gender-power relations as predictors of condom use self-efficacy among South African women. Health Psychol Open 2015; 2(2): 2055102915598676. [http://dx.doi.org/10.1177/2055102915598676] [PMID: 28070366] ] These papers examined and narrated self-efficacy and clinical performance in different countries. The qualitative studies in this study had a common factor there is a relationship between self-efficacy and clinical performance. Self-efficacy plays a protective role when the person is experiencing emotional exhaustion and high stress conditions [27Smolen-Hetzel A. Geropsychiatric nursing staff: The role of empowerment, geriatric caregiving self-efficacy, and emotional labour at work 2010., 33Awases M H, Bezuidenhout M C, Roos J H. Factors affecting the performance of professional nurses in Namibia. Curationis 2013; 36(1): 1-8. [http://dx.doi.org/10.4102/curationis.v36i1.108] , 34Cheraghi F, Hassani P, Yaghmaei F, Alavi-Majed H. Developing a valid and reliable Self-Efficacy in Clinical Performance scale. Int Nurs Rev 2009; 56(2): 214-21. [http://dx.doi.org/10.1111/j.1466-7657.2008.00685.x] [PMID: 1964 6171] ] Therefore, a person who is emotionally exhausted has difficulty in performing the usual duties. Several studies [20Thulth AS, Sayej S. Selected Organizational Factors Affecting Performance of Professional Nurses in North West Bank Governmental Hospitals. J Educ Pract 2015; 6(7): 100-10. http://iiste.org/Journals/index.php/JEP, 28The Lewin Group. Quality of Care and litigation in Tennessee Nursing Home 2009; 1-40.-31Kok MC, Muula AS. Motivation and job satisfaction of health surveillance assistants in Mwanza, Malawi: an explorative study. Malawi Med J 2013; 25(1): 5-11. [PMID: 23717748] ] indicated that shortage of personnel to perform specific duties at work place negatively affect self- efficacy of the nurses, and thus, can lead to poor performance due to demotivation. Other studies had evidence that mentoring, exposure to clinical skills, practise and support of personnel improves self-efficacy [3Warne T, Johansson UB, Papastavrou E, et al. An exploration of the clinical learning experience of nursing students in nine European countries. Nurse Educ Today 2010; 30(8): 809-15. [http://dx.doi.org/10.1016/j.nedt.2010.03.003] [PMID: 20409620] , 6Takase M. The relationship between the levels of nurses’ competence and the length of their clinical experience: a tentative model for nursing competence development. J Clin Nurs 2013; 22(9-10): 1400-10. [http://dx.doi.org/10.1111/j.1365-2702.2012.04239.x] [PMID: 2295 7733] , 8Kennedy E. The nursing competence self-efficacy scale (NCSES): An instrument development and psychometric assessment study 2013., 18Makhado L, Davhana-Maselesele M. Knowledge and psychosocial wellbeing of nurses caring for people living with HIV/AIDS (PLWH). Health SA Gesondheid 2016; 21(1)[http://dx.doi.org/10.4102/hsag.v21i0.929] , 21Makunyane CM. Factors influencing performance of nurses in the Makhuduthamaga Sub-District, Sekhukhune District, Limpopo Province, South Africa (Doctoral dissertation) 2012., 26Shirazi F, Sharif F, Molazem Z, Alborzi M. Dynamics of self-directed learning in M. Sc. nursing students: A qualitative research. Journal of advances in medical education & professionalism 2017; 5(1): 33., 32Tiwaken SU, Caranto LC, David JJT. The real world: lived experiences of student nurses during clinical practice. International Journal of Nursing Science 2015; 5(2): 66-75. [http://dx.doi.org/10.5923/j.nursing.20150502.05] -34Cheraghi F, Hassani P, Yaghmaei F, Alavi-Majed H. Developing a valid and reliable Self-Efficacy in Clinical Performance scale. Int Nurs Rev 2009; 56(2): 214-21. [http://dx.doi.org/10.1111/j.1466-7657.2008.00685.x] [PMID: 1964 6171] ]. There is also empirical evidence that quality of care for the clients is affected if the nurses have low self- efficacy [19Soudagar S, Rambod M, Beheshtipour N. Factors associated with nurses’ self-efficacy in clinical setting in Iran, 2013. Iran J Nurs Midwifery Res 2015; 20(2): 226-31. [PMID: 25878701] , 34Cheraghi F, Hassani P, Yaghmaei F, Alavi-Majed H. Developing a valid and reliable Self-Efficacy in Clinical Performance scale. Int Nurs Rev 2009; 56(2): 214-21. [http://dx.doi.org/10.1111/j.1466-7657.2008.00685.x] [PMID: 1964 6171] , 36Webster PD, Sibanyoni M, Malekutu D, et al. Using quality improvement to accelerate highly active antiretroviral treatment coverage in South Africa. BMJ Qual Saf 2012; 21(4): 315-24. [http://dx.doi.org/10.1136/bmjqs-2011-000381] [PMID: 22438327] ]. This narrative review of literature revealed that nurses do not have confidence to initiate clients on ART after NIMART training course. A need for on-the-job mentorship and support in order to maximise clinical outcomes related to HIV and improve self-efficacy of the professional nurses was suggested [17Mngqibisa R, Muzigaba M, Ncama BP, Pillay S, Nadesan-Reddy N. Upskilling nursing students and nurse practitioners to initiate and manage patients on ART: An outcome evaluation of the UKZN NIMART course. Afr J Health Prof Educ 2017; 9(3): 153-8. [http://dx.doi.org/10.7196/AJHPE.2017.v9i3.879] ]. Therefore, mentoring and support of the professional nurses after training is important for nurses to develop self-efficacy in the initiation and management of clients on ART for better clinical outcomes. Nurses as the largest group within the multidisciplinary team, have a vital role to play if success is to be achieved [37Dennill K, King L, Van Blerk L. Nurses respond to South Africa's HIV and AIDS and STI National Strategic Plan (2007-2011): infection control. Professional Nursing Today 2009; 13(3): 12-5. https://hdl.handle.net/10520/EJC79308]. Professional nurses are ideally committed to the broad aims of quality care; and their main concern to provide high standard services and to meet the needs of individual service users, their families, and communities [38Polit DF, Beck CT. Essentials of nursing research: Appraising evidence for nursing practice. Lippincott Williams & Wilkins 2010.-40World Health Organization. Task shifting: rational redistribution of tasks among health workforce teams: global recommendations and guidelines. 2007. ISBN 978 92 4 159631 2]. Self-efficacy influences the task employees choose to perform and the goals they set for themselves [20Thulth AS, Sayej S. Selected Organizational Factors Affecting Performance of Professional Nurses in North West Bank Governmental Hospitals. J Educ Pract 2015; 6(7): 100-10. http://iiste.org/Journals/index.php/JEP, 21Makunyane CM. Factors influencing performance of nurses in the Makhuduthamaga Sub-District, Sekhukhune District, Limpopo Province, South Africa (Doctoral dissertation) 2012., 30Jamshidi N, Molazem Z, Sharif F, Torabizadeh C, Najafi Kalyani M. The challenges of nursing students in the clinical learning environment: A qualitative study. Sci World J 2016; 2016: 1846178. [http://dx.doi.org/10.1155/2016/1846178] [PMID: 27366787] , 31Kok MC, Muula AS. Motivation and job satisfaction of health surveillance assistants in Mwanza, Malawi: an explorative study. Malawi Med J 2013; 25(1): 5-11. [PMID: 23717748] , 41Buhat-Mendoza DG, Mendoza JNB, Tianela CT, Fabella EL. Correlation of the academic and clinical performance of Libyan nursing students. J Nurs Educ Pract 2014; 4(11): 82. [http://dx.doi.org/10.5430/jnep.v4n11p82] ]. Self-efficacy can affect people’s behaviour positively or negatively, and this behaviour, may have an impact on one’s performance and clinical outcome for the clients [10Dieleman M, Gerretsen B, van der Wilt GJ. Human resource management interventions to improve health workers’ performance in low and middle income countries: a realist review. Health Res Policy Syst 2009; 7(1): 7. [http://dx.doi.org/10.1186/1478-4505-7-7] [PMID: 19374734] ]. Self-efficacy and clinical performance have relevancy in health care practices. These practices are gained through knowledge and skills, therefore, the expectation is to have good clinical outcomes [7Bandura A. On the functional properties of perceived self-efficacy revisited 2012. [http://dx.doi.org/10.1177/0149206311410606] , 32Tiwaken SU, Caranto LC, David JJT. The real world: lived experiences of student nurses during clinical practice. International Journal of Nursing Science 2015; 5(2): 66-75. 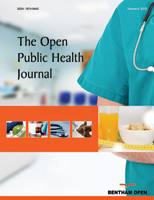 [http://dx.doi.org/10.5923/j.nursing.20150502.05] ]. Professional nurses need to be well trained, knowledgeable, confident and have clear job description for better clinical management of clients. Self-efficacy is not only needed on rational decision making, but also to build trust with clients in clinical management of HIV/AIDS affected clients [23Reeve J. Why teachers adopt a controlling motivating style toward students and how they can become more autonomy supportive. Educ Psychol 2009; 44(3): 159-75. [http://dx.doi.org/10.1080/00461520903028990] ]. Trust is important, especially in this era of HIV/AIDS prevalence because trust can influence a client to behaviour change. People with positive self-efficacy display mastery of their environment and more confident in acting safe and competent in challenging situations. Mastery experience is the most influential source of self-efficacy because it provides the most authentic evidence of whether one can master a skill and what it takes to succeed or reach a goal [22Crannell BA, Witte MM. Clinical practice of registered nurses and learning styles preferences. Institute for Learning Styles Journal 2012; 1(1): 1-7., 42Smith J, Odera DN, Chege D, et al. Identifying the gaps: An assessment of nurses’ training, competency, and practice in HIV care and treatment in Kenya. J Assoc Nurses AIDS Care 2016; 27(3): 322-30. [http://dx.doi.org/10.1016/j.jana.2016.01.005] [PMID: 27086191] ]. Therefore, nurses who are the backbone of the Department of Health, need to be upskilled, motivated and supported to have confidence in implementing NIMART. Lack of social support, knowledge, practice, shortage of staff and work-load can affect self-efficacy negatively. These challenges can affect the quality of care delivered by the nurses for the clients [29Shipanga VM. The perception of the care and support services for nurses caring for patients with HIV/AIDS in the Intermediate Hospital Oshikati (IHO) Doctoral dissertation 2011., 33Awases M H, Bezuidenhout M C, Roos J H. Factors affecting the performance of professional nurses in Namibia. Curationis 2013; 36(1): 1-8. [http://dx.doi.org/10.4102/curationis.v36i1.108] ]. Lack of motivation and absence of hygiene factors were also identified as aspects that can lower self-efficacy of nurses consequential to poor clinical performance [20Thulth AS, Sayej S. Selected Organizational Factors Affecting Performance of Professional Nurses in North West Bank Governmental Hospitals. J Educ Pract 2015; 6(7): 100-10. http://iiste.org/Journals/index.php/JEP]. Lack of confidence in professional nurses in implementing NIMART can also lead to poor management of clients. People with lack of confidence exhibit low self-efficacy which interfere with initiation and pursue of intentions of NIMART programme [8Kennedy E. The nursing competence self-efficacy scale (NCSES): An instrument development and psychometric assessment study 2013.]. Therefore, experience, clinical practice, motivation, supervision, support and knowledge are needed to develop the nurse’s confidence and morale [7Bandura A. On the functional properties of perceived self-efficacy revisited 2012. [http://dx.doi.org/10.1177/0149206311410606] , 42Smith J, Odera DN, Chege D, et al. Identifying the gaps: An assessment of nurses’ training, competency, and practice in HIV care and treatment in Kenya. J Assoc Nurses AIDS Care 2016; 27(3): 322-30. [http://dx.doi.org/10.1016/j.jana.2016.01.005] [PMID: 27086191] ]. Learning has a positive effect on self-efficacy in clinical performance of nurses as it increases their self-efficacy [8Kennedy E. The nursing competence self-efficacy scale (NCSES): An instrument development and psychometric assessment study 2013., 43Farley JE, Stewart J, Kub J, Cumpsty-Fowler C, Lowensen K, Becker K. Development of The Johns Hopkins University School of Nursing Adult/Geriatric Primary Care Nurse Practitioner Program in HIV Prevention, Treatment, and Care. J Assoc Nurses AIDS Care 2016; 27(3): 223-33. [http://dx.doi.org/10.1016/j.jana.2015.12.006] [PMID: 26852319] ]. Self- efficacy has been associated with enhanced motivation, strong self-direction and goal orientated. Therefore, positive self-efficacy will enhance clinical performance. Self-efficacy is also gained by modelling achievements from other people thus gaining self-efficacy in performing a task. Peer education, mentoring and working with patients also play a significant role in building self-efficacy in professional development [13Mensah AO, Lebbaeus A. The influence of employees’ self-efficacy on their quality of work life: The case of Cape Coast, Ghana. Int J Bus Soc Sci 2013; 4(2), 44Fournier B, Kipp W, Mill J, Walusimbi M. Nursing care of AIDS patients in Uganda. J Transcult Nurs 2007; 18(3): 257-64. [http://dx.doi.org/10.1177/1043659607301301] [PMID: 17607063] ]. This explains that learning from peers in clinical practice is an important aspect in building self-efficacy. Therefore, sufficient skill and ability to perform a task are very important to enhance one’s self-efficacy. High level of self-efficacy will result in high level of work performance; and there is a relationship between self-efficacy and work performance [19Soudagar S, Rambod M, Beheshtipour N. Factors associated with nurses’ self-efficacy in clinical setting in Iran, 2013. Iran J Nurs Midwifery Res 2015; 20(2): 226-31. [PMID: 25878701] , 27Smolen-Hetzel A. Geropsychiatric nursing staff: The role of empowerment, geriatric caregiving self-efficacy, and emotional labour at work 2010.]. High self-efficacy also plays a protective role from experiencing more emotional exhaustion when in stressful condition [27Smolen-Hetzel A. Geropsychiatric nursing staff: The role of empowerment, geriatric caregiving self-efficacy, and emotional labour at work 2010.]. Therefore, self-efficacy is very crucial in clinical performance of health workers. Self-efficacy and resilience at workplace is a positive aspect in clinical practice and can enhance confidence [26Shirazi F, Sharif F, Molazem Z, Alborzi M. Dynamics of self-directed learning in M. Sc. nursing students: A qualitative research. Journal of advances in medical education & professionalism 2017; 5(1): 33.]. Employees that are motivated, well skilled, involved in practice are likely to perform to their best level, proficient and resourceful than those with low self-efficacy. HIV/AIDS continues to be a global public-health problem, therefore NIMART is the best strategy identified to improve access to ART care. The Johns Hopkins University School of Nursing embarked on a transformative curriculum overhaul to integrate HIV prevention, treatment, and care into the Adult /Geriatric Nurse Practitioner Program. There is a need to implement strategies to upskill nurses in the clinical management of HIV and AIDS, for effective and efficient management of people living with HIV, in the South African context [17Mngqibisa R, Muzigaba M, Ncama BP, Pillay S, Nadesan-Reddy N. Upskilling nursing students and nurse practitioners to initiate and manage patients on ART: An outcome evaluation of the UKZN NIMART course. Afr J Health Prof Educ 2017; 9(3): 153-8. [http://dx.doi.org/10.7196/AJHPE.2017.v9i3.879] ]. Therefore, a training on NIMART was conducted for nurses at the University of KwaZulu Natal. Upskilling nurses by training was conducted to ensure that they have the required knowledge to implement NIMART for access of care by clients [42Smith J, Odera DN, Chege D, et al. Identifying the gaps: An assessment of nurses’ training, competency, and practice in HIV care and treatment in Kenya. J Assoc Nurses AIDS Care 2016; 27(3): 322-30. [http://dx.doi.org/10.1016/j.jana.2016.01.005] [PMID: 27086191] ]. However, there is a gap in implementing NIMART. The nurses indicated they need mentoring, support and practice to build confidence in order to manage those affected with HIV/AIDS. Notwithstanding the implementation of NIMART in Kenya, nurses have gaps in training, competency, and practice in HIV care and treatment. It was recommended that further investment in nurse capacity building is needed to bridge the gaps and prepare nurses to provide high-quality, comprehensive HIV care and treatment [42Smith J, Odera DN, Chege D, et al. Identifying the gaps: An assessment of nurses’ training, competency, and practice in HIV care and treatment in Kenya. J Assoc Nurses AIDS Care 2016; 27(3): 322-30. [http://dx.doi.org/10.1016/j.jana.2016.01.005] [PMID: 27086191] ]. Therefore, if the nurses are not well trained, their self-efficacy will be compromised by incompetency, resulting in poor management of the clients. In a multi-country study conducted from 2007 to 2011 in five countries (Angola, Burundi, Lesotho, Mozambique and South Africa), successful ARV roll-out was observed, despite HRH shortages, skill scale up [44Fournier B, Kipp W, Mill J, Walusimbi M. Nursing care of AIDS patients in Uganda. J Transcult Nurs 2007; 18(3): 257-64. [http://dx.doi.org/10.1177/1043659607301301] [PMID: 17607063] ], which suggest that these countries have adapted a similar model of upskilling and mentoring as an antidote in speeding up the implementation of NIMART for the purpose of building self-efficacy in nurses. This narrative review has shown that there are gaps in nurses’ skills and self-efficacy regarding the implementation of NIMART. Experiential learning, support, supervision, skills update, mentoring and peer education are fundamental aspects to enhance self-efficacy and quality improvement in the management of clients by professional nurses. Several studies have alluded to the fact that self-efficacy is the motivation that a person needs to accomplish a task or a goal. Therefore, there is a need to motivate and build self-efficacy among professional nurses, especially in South Africa. Risk of biasness due to only two researchers viewed the literature for this study and only English written papers were included in the study. The authors declare that they have no competing interest, financial or otherwise. Newark PE. Self-beliefs, resources, and self-regulation in adult ADHD psychotherapeutical relevance and implications (Doctoral dissertation, University_of_Basel) 2014. Kennedy E. The nursing competence self-efficacy scale (NCSES): An instrument development and psychometric assessment study 2013. Van Damme W, Kober W, Laga K, Letsoalo M. HIV Nursing Matters. HIV Paediatrics Issues 2011; 2(3): 12. Makunyane CM. Factors influencing performance of nurses in the Makhuduthamaga Sub-District, Sekhukhune District, Limpopo Province, South Africa (Doctoral dissertation) 2012. Crannell BA, Witte MM. Clinical practice of registered nurses and learning styles preferences. Institute for Learning Styles Journal 2012; 1(1): 1-7. Shirazi F, Sharif F, Molazem Z, Alborzi M. Dynamics of self-directed learning in M. Sc. nursing students: A qualitative research. Journal of advances in medical education & professionalism 2017; 5(1): 33. Smolen-Hetzel A. Geropsychiatric nursing staff: The role of empowerment, geriatric caregiving self-efficacy, and emotional labour at work 2010. The Lewin Group. Quality of Care and litigation in Tennessee Nursing Home 2009; 1-40. Shipanga VM. The perception of the care and support services for nurses caring for patients with HIV/AIDS in the Intermediate Hospital Oshikati (IHO) Doctoral dissertation 2011.